PLAZA – The closed Plaza Design store might have suffered a fate even more dire than going out of business Tuesday afternoon, March 13 – destruction by fire. Arcata Police arrested Matthew Brian Beattie, 33, and Crystal Lyn Pace, 26, on felony arson charges over an incident which took place at the store around noontime. Having gained access through the front door, the two allegedly placed a smoldering napkin just inside the unoccupied store’s entrance. The front door had been left unlocked by an employee of the Arcata Economic Development Corporation (AEDC) who had been making deliveries of merchandise about two hours beforehand. 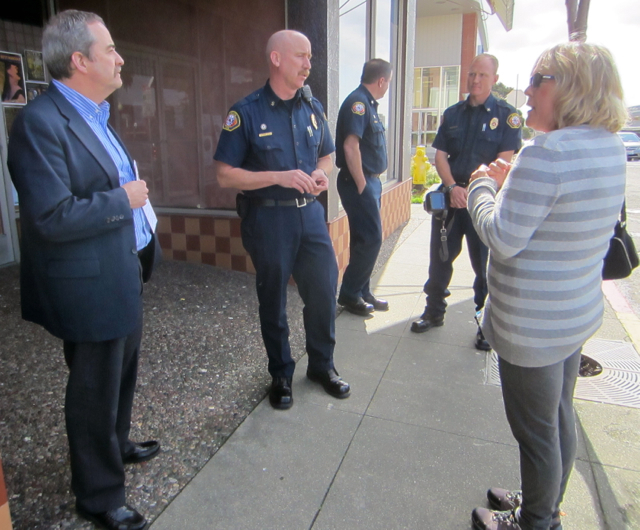 Alerted to the unsecured business and the developing fire hazard, Arcata Police and Arcata Fire responded in force. 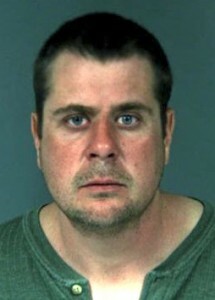 Beattie and Pace were arrested about three hours after the incident. 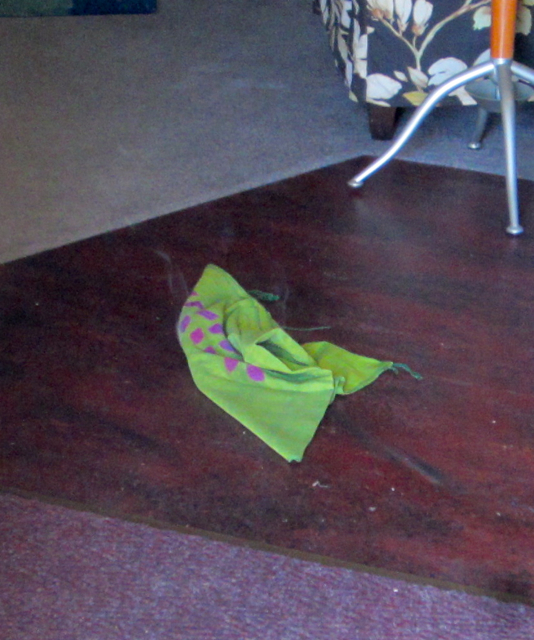 Witnesses had observed them at the scene just prior to discovery of the smoking napkin. The two apparently spent the rest of the afternoon wandering around the Plaza. 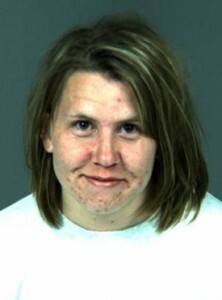 With the help of a witness, APD officers located Beattie and Pace at Jacoby’s Storehouse. 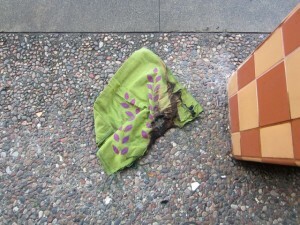 The two reportedly admitted setting the napkin on fire and leaving it inside the store. 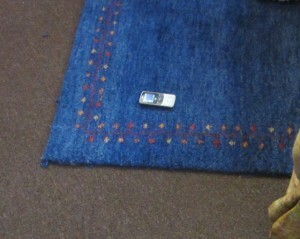 Also found inside the store was a cell phone which Dokweiler said belonged to Pace. He didn’t know why it had been left behind. Dokweiler said the two were “very intoxicated” when they were apprehended. Plaza Design, wide open and unprotected Tuesday at noon. The smoldering napkin is barely visible just inside the door, on the left. Note: this incident involved not one, not two, but no fewer than three Arcata Eye personnel. That makes it difficult to impossible to relate the details in traditional, quasi-objective news style without a bunch of awkward write-arounds. So here, in the editor’s own words, is a little pronoun festival composed yesterday evening regarding the day’s bizarre occurrences. – Ed. As I write this, Arcata Police are interviewing two suspects whom they will likely charge with attempted arson at Plaza Design, according to APD Sgt. Ron Sligh. It’s rare but not unheard-of for newspaper personnel to be involved in a news story, since we sometimes arrive at crime scenes even before police do. But this time, this song is playing loudly in my so-called mind, since no fewer than three Eye peeps were in on this one. The excitement of journalism is that you never know what is going to happen on any given day, and when it does, you have to drop everything and rise to the challenge of covering whatever it is, from nimrod imbroglios to serious upheavals and everything in between. Note to self: keep your camera batteries charged and make sure you have a pen on you. Today’s drama began at about 11:50 a.m. I was sitting at my desk when Karrie Lee Wallace, our distribution manager called with a tip about a photo op she noticed while delivering papers. She does that from time to time. Karrie had been making deliveries and noticed some people lying in the doorway of Plaza Design. In passing, she thought she had glimpsed red and white garments, and a brown sleeping bag. While there wasn’t anything particularly unusual or newsworthy about people lying in doorways in downtown Arcata, Karrie has tipped me off to potentially interesting situations before, so I slumped my bulk over to Plaza Design. When I got there just before noon, the layabouts had left. All that was left in the doorway was an empty booze bottle and some cigarette butts. But I noticed that people have begun using the front window to post flyers, so I started taking pictures because you never know when they might come in handy. At this point my friend Kash Boodjeh walked by, headed west. I thought maybe he was headed back to his office after a visit to City Hall, so I related the story in hopes he had seen the reported doorway occupants earlier. He hadn’t. For some reason, Kash went over and tried the front door, even though it was closed and presumably locked. It wasn’t. The door opened freely, exposing the shadowy interior and the wealth of upscale merchandise sitting inside, unguarded and vulnerable. 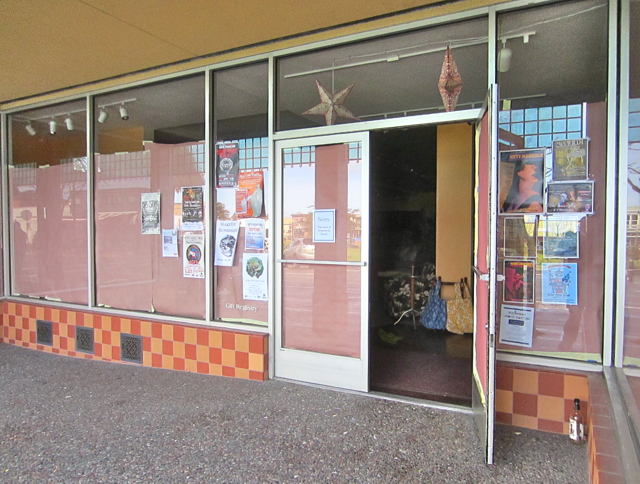 The Arcata Economic Development Corporation(AEDC) has papered over the store’s windows, and with no lights on, the place looked dark and spooky. And smoky. Against Karrie’s urging Kash and I rather impetuously went inside to check it out, and on entry, a distinct burny smell immediately hit my nose. I called Arcata Police on the spot. Kash and I didn’t find anyone inside, but we noticed that there wasn’t any smoke in the back of the store. On returning to the front, we noticed something we had walked right past on the way in – a smoldering cloth napkin several feet inside the door. 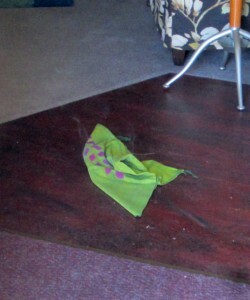 It rested on a wooden floor between carpeted areas, and looked like it had been tossed there from the front door. Wisps of smoke were curling up from it. To the right inside of the door were more napkins and cloth items similar to the burning one sitting on one of those plush chairs that Plaza Design specializes in. On the floor on the far side of the chair was a cell phone which looked definitely out of place. Arcata Police and Arcata Fire personnel soon arrived in force. APD sent K-9 Officer Zari in to find any suspects, and surely did a more thorough search than we had. But no one was in there. The fire folks moved the smoking napkin to the pebble-paved entrance out front of the store. APD then taped the entrance off as a crime scene and started gathering evidence. They took the bottle and even gathered up the cigarette butts one at a time. 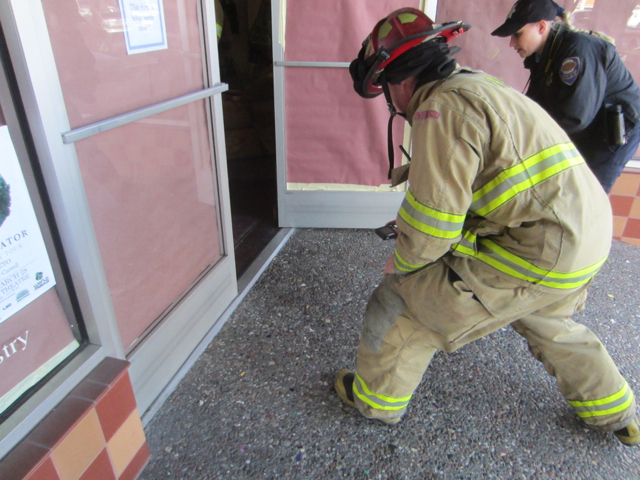 Arcata Fire and APD personnel gather evidence in the store's doorway. I called the building’s owner, Julie Fulkerson and AEDC. After Julie and AEDC’s Ross Welch had met, I spoke with them. Ross said one of his people had been making deliveries at the store at around 10 a.m. That was apparently the last time the door had been opened. Ross didn’t know why the windows had been papered, and said maybe the paper would be taken down. Assistant Fire Chief Desmond Cowan busted out the department’s thermal imaging unit and did a thorough interior scan for hot spots. He took the key to the place from Ross and was to return every hour to scan for any flare-ups. Ross Welch, Desmond Cowan and Julie Fulkerson discuss their exciting lunch hour. 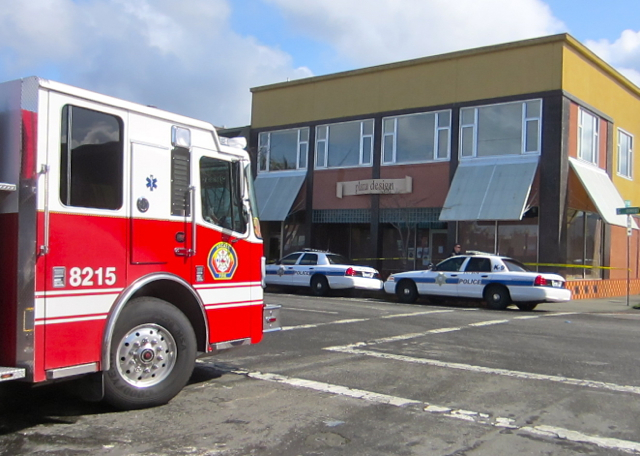 Arcata Fire takes the east side of the Plaza deadly seriously, and it is always on firefighters’ minds as a catastrophe waiting to happen. The Plaza Design building was built in 1913, and the structures in the 800 block of G Street are even older, dating from 1889 to 1904. Today’s thermal scan confirmed that the Plaza Design building uses the now-banned “balloon” framing, a long-outmoded method of building construction which expedites fire propagation. Desmond said that any fire that broke out on the south end would inexorably march northward from building to building. The only sure of way of stopping the conflagration would be to demolish and remove part of a structure and make a gap or firebreak two or three buildings ahead of an advancing fire. Rather than risk that scenario further distracting everyone’s day, Desmond was happy to stroll around the block from the main station to make the hourly scans. I went back to the office and worked through the afternoon. A little after 3 p.m., our Ad Manager Helen Wilson and our Ad Rep Mark Tozer (who, by the way, are to be betrothed this Sunday!) were headed out the door for some field work when I just happened to mention the morning’s freaky festivities. I thought Helen had been aware of it, but it turns out there are some people who go literally hours without looking at Facebook. Mark suddenly piped up with the news that he had noticed the doorway slouchers during his sales rounds that morning. He remembered them from an earlier encounter – he’d pulled up to an intersection and had observed them as they crossed the street in front of him. An outdoorsman with a clear headedness not commonly encountered in Arcata, plus a keen eye for detail, Mark was able to relate to police an impressively detailed description of the doorway denizens. With that, he and Helen departed. A few minutes later at about 3:30 p.m., Mark called from the Plaza. “They’re in front of Everett’s,” he said. “They’re walking away from me.” I immediately called APD and after waiting on hold for what seemed like forever, but technically wasn’t, told Sgt. Ron Sligh that the suspects were on the Plaza. In the time it took me to get from the fourth floor of Jacoby’s Storehouse to the street level, APD had deployed in force on the Plaza. I saw Mark on the northwest quadrant and called him. “You’re not going to believe this,” he said. “They’re going into Jacoby’s Storehouse.” At that point I noticed a mini-phalanx of officers marching my way. The hot mess of the day so far became a roiling meltdown at this point. I tried to get in to Jacoby’s, but as fate would have it, an enormous family of enormous people – midwesterners, they looked like – was making its way into the front door. I had to wait while the tourists wandered widely down the narrow front hall. Beattie and Pace encounter APD officers in the entrance to Jacoby's Storehouse. And there in the lobby’s kiosk was the couple Mark had described so precisely, right down to the woman’s pink striped blouse. She also wore a white sweater, and he was toting a red and gray backpack with bright red straps. They couldn’t have been in the kiosk more than minute or so, but for whatever reason – maybe they felt the hot breath of the media and APD bearing down on them? – the two got up and headed for the front door. They reached it just as the mini-battalion of APD officers were entering. The couple actually brushed right past the officers in the doorway on their way out as the cops looked askance at them as only cops can. I suppose there is an ethical argument that forbade me from interacting with police in the circumstances. But I toured majestic St. Mary’s Church two days before it went up in smoke from a campfire in its crawlspace. I watched the Feuerwerker Building and NEC/Marino’s/Arcata Paint across the street burn down. The whole Plaza is, historically speaking, an intermittent inferno, most of it having burned up at one time or another. If someone is implicated in making this horrendous history repeat, with so many people and jobs and so much property at risk, and I can point ’em out to the cops, I am going to do so. Further, three of us at the paper had already interacted with police on this incident, so at that point any hoity-toity J-school arguments against directing the cops to these persons of interest were of no moment whatsoever. I gestured at the officers, “That’s them!” The officers reversed direction and quickly caught up with the the man and woman in front of Mazzotti’s. Encircled by officers, the two were preliminarily questioned. 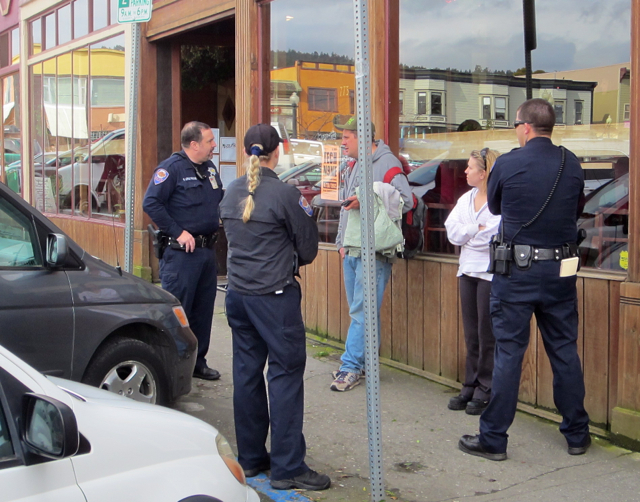 With the 800 block of G Street which had been placed at risk of fire reflected in the window of Mazzotti's behind them, APD officers interview the two suspects. Arrests were soon to follow. The second floor of that building is loaded with working people in the middle of the day. So are the buildings up the rest of the block. What unfathomable motivation could someone have had to so casually place all of them at such grave risk of their lives? 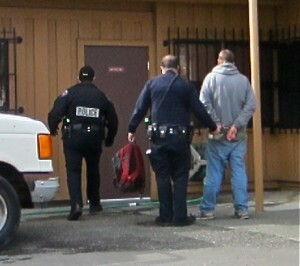 Arrests followed, and after the male did a perp walk from the APD car into the station for lengthier interrogation, Sgt. Sligh said the two had “basically admitted” leaving the burning napkin inside the store. He said they would likely be charged with attempted arson. This is, in part, why subscription renewals are going to go out two days later than I had planned. Now if everyone will stop making so much damn news for a few days, I can get the renewals done and start on next week’s edition in an orderly fashion. This entry was posted on Wednesday, March 14th, 2012 at 6:05 pm	and is filed under News, Community, Business. You can follow any responses to this entry through the RSS 2.0 feed.